Breathtaking design meets unrivaled craftsmanship in the KOHLER(R) Tailored vanity collection. No detail was overlooked in the meticulous crafting of this collection, from the premium hardwoods to the specially designed hardware and vanity tops, all available in an array of finishes to create your own look. This Damask vanity cabinet reflects the rich details found in colonial American architecture. Complete your bathroom vanity with a coordinating top, hardware, and accessories from the collection. The Layla 60 inch vanity presents a sleek and attention-grabbing profile that will make your bathroom "The Room" in your home. A pristine white finish and dazzling blue glass hardware please the eye while the solid wood frame, dovetail joint construction, and soft-close glides and hinges testify to quality craftsmanship. Layla's uncluttered panels allow the beauty of its design and construction to shine through. A matching mirror and linen tower allow you to create a complete design palette. Let Layla bring your bathroom to life. Indulge the aesthetic principal with this stunning and spacious 60" white Bosconi double vanity set. The integrated ceramic sinks and perfectly coordinating mirrors lend to a polished and efficient design. Features include two spacious cabinets with soft closing doors, as well as, two large pull out drawers. Plenty of space to accommodate towels, toiletries and bathroom accessories. Explore a classically modern touch with this white Bosconi double vanity set. The ceramic Vessel sinks and perfectly coordinating mirrors lend to a smart and efficient design. Features include two spacious cabinets with soft closing doors, as well as, two large pull out drawers. Plenty of space to store your towels, toiletries and bathroom accessories. Side cabinet included. 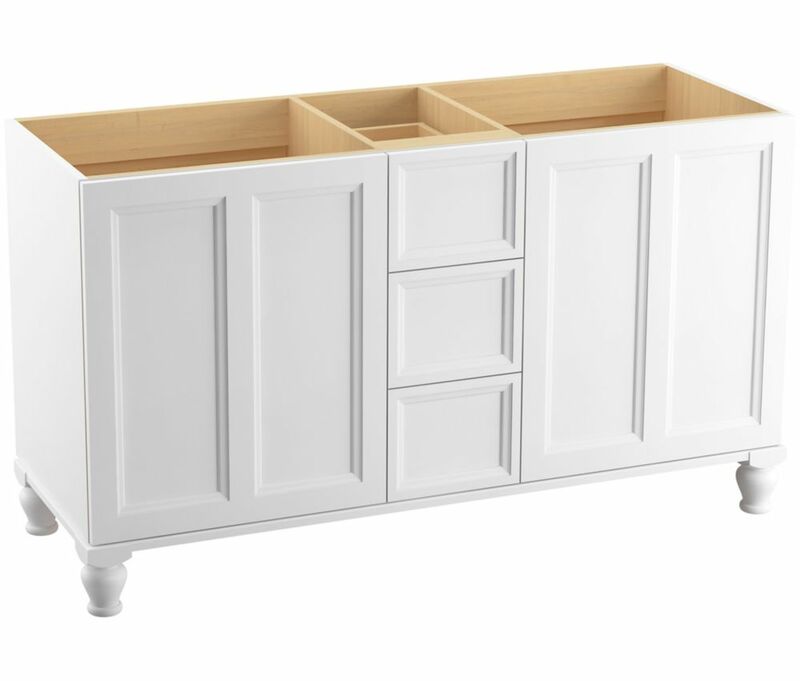 Damask 60 inch Vanity With Furniture Legs, 2 Doors And 3 Drawers, Linen White Breathtaking design meets unrivaled craftsmanship in the KOHLER(R) Tailored vanity collection. No detail was overlooked in the meticulous crafting of this collection, from the premium hardwoods to the specially designed hardware and vanity tops, all available in an array of finishes to create your own look. This Damask vanity cabinet reflects the rich details found in colonial American architecture. Complete your bathroom vanity with a coordinating top, hardware, and accessories from the collection.